NOTES: The Cobra Eel, or Eels as stated on the filecard, is a popular figure for collectors to buy in quantity. This of course will increase demand and prices will follow suit. The black mouthpiece is often missing or broken, so don't be surprised if these Frogmen increase in value. 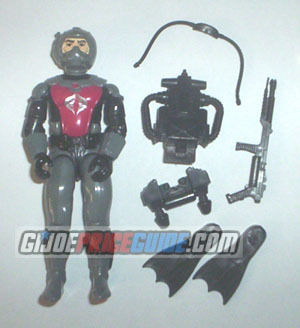 There are also common paint ware issues around the wrists and with the Cobra insignia. This is a well sculpted figure with great accessories. Watch out for blue accessory pack weapons that did not originally come with the figure.